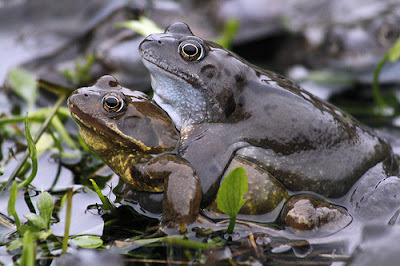 There's nothing subtle about the wooing of European common frogs. Males grow spiny pads on their thumbs during the breeding season, the better to grip their mates. As if that weren't enough, the pads also seem to channel pheromones out of a frog's hands and straight into his female partner's body. Frogs fertilize their eggs out in the open, so you might think there'd be no need for all this effort. Yet males of most frog species can be seen during the mating season "taking a piggyback ride" on their mates, as a group of scientists in Belgium euphemistically puts it. Technically called amplexus, the male-on-top position allows him to fertilize the eggs just as the female sends them out of her body. In some frog and salamander species, males further ensure their success by temporarily growing tough, often spiky pads on their forearms or thumbs. Earlier research discovered glands of some sort sitting beneath these pads, but it wasn't clear what the glands did. So the scientists in Belgium decided to take a closer look at the hands of one such animal: Rana temporaria, the European common frog. The scientists used micro-CT scanning to build a 3D image of a male frog's thumb pad. They saw that glands underneath the pad led to ducts, which traveled up through the pad to pores on its surface. It appeared that the grippy gloves donned by males for the mating season were also some sort of delivery system. But what were they delivering? An analysis of proteins in the glands turned up a group of molecules the authors dubbed "amplexins." They're in the same family as certain proteins found in male mammals' reproductive organs, as well as a courtship pheromone in salamanders. In humans, proteins from this family help regulate how eggs and sperm interact. Comparing thumb pads in the breeding season to shrunken-back thumb pads during the rest of the year, the scientists saw that amplexin production suddenly dropped off near the end of the breeding season. During the rest of the year, the frogs didn't make amplexins at all. A male who's already got his hooks—literally—into his partner probably doesn't need to worry about courtship. But the authors speculate that amplexins in these frogs might be pheromones that speed up the mating process. Female frogs' chests are often scraped and scratched by their mates' spiny thumb pads, and this may be how a male delivers the pheromones to his partner: straight into her circulatory system. Hey, it works for Cupid and his arrows. Female frogs, though, would probably give this system two thumbs down.